Whether you’re buying your first kitchen mixer or looking for more flexibility than is offered by your stand mixer, a handheld electric mixer is a great option. It can do many of the same jobs as a stand mixer and will take up much less space in your kitchen. Our top pick from the bunch is the Breville BHM800SIL Handy Mix Scraper Hand Mixer. By no means the cheapest mixer on offer, it is thoughtfully designed with the discerning baker or cook in mind. The convenient extra features such as the built-in light and intuitive speed controls make food preparation that much easier, while the mixer is powerful yet easy to use. We think it’s well worth the investment. An electric hand mixer works by twirling electric beaters against each other so they mesh, spinning and blending the food in the bowl. You can use an electric mixer for anything from mashed potatoes to cake batter. Because these mixers are portable, you can use any bowl you choose. It’s hard to talk about mixers of any sort without bringing up KitchenAid, a famous kitchen supply company that occupies about half of the stand mixer market. 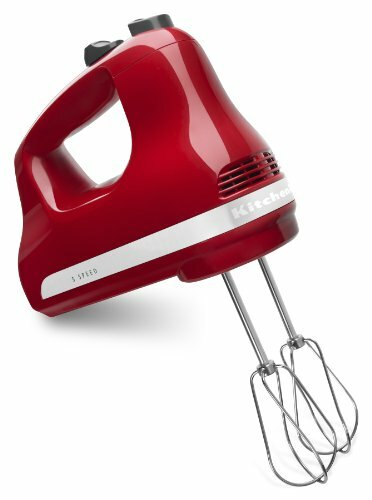 The KHM512ER is a simple, 5-speed mixer with a quiet 145-watt motor and elegant, modern beaters. One of the primary concerns when considering which hand mixer to purchase is how easy — or difficult — it is to clean the attachments. While this mixer doesn’t have a lot of attachments to choose from, the primary beaters eschew the traditional center pillar and have strong, thin blades that are a breeze to clean; they’re rather like a blend between a whisk attachment and a traditional beater. This KitchenAid isn’t the only model that comes with these attachment types – almost all our picks use them by default. Regardless, they’re certainly a major strong point for any hand mixer. This is not the mixer you want to choose if you want speed. In fact, it’s one of the slowest mixers out there on the slow setting. The five speeds are well differentiated, with the highest speed barely fast enough to whip a meringue. The slow speeds are perfect for languid kneading and slow mixing. At high speeds, you’ll still be able to hit soft peaks for cream in less than a minute. While the KitchenAid KHM512ER is very much the gold standard, the other mixers on our list all have a few features that differentiate them from this model. If you need a general hand mixer for your kitchen and don’t need super high speeds, this is a great choice. 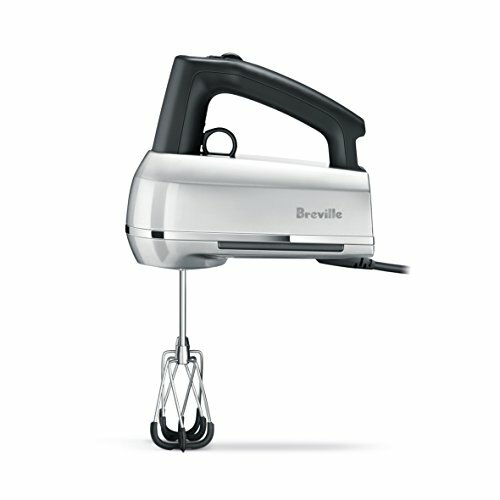 The Breville BHM800SIL is a 240-watt hand mixer that offers the same basic set of features as the Cuisinart HM-90S while adding a few unique twists to the package. It has a swiveling cord, a clear case for compact storage, and an LED display on the top. It comes with whisks and dough hooks, but the real notable attachment is Breville’s take on the traditional beater heads. Their modern beaters have a soft coating on the bottom so you can mix your ingredients right at the base of any bowl without worrying about scratching it. Breville has added an electronic speed control that guesses what you’re doing based on the attachment you use. The slow start features on this Breville are much more effective than the Cuisinart at reducing splatter; you’re still in full control of your speed after the first few guided seconds. There’s a count-up timer on the top of the unit that records exactly how long you’ve been mixing things for precise baking. When you pause the timer, the mixer pauses too and remembers its speed for when you’re ready to resume things. Finally, a built-in light illuminates your work area so you can see what’s going on. We were skeptical of this feature until we realized just how big the shadow of a hand mixer is. Your mixer is almost always between your lights and your bowl, so having a light on the mixer is more helpful than it seems. The Breville BHM800SIL is not a budget option. All these features come at a cost, so this model is more expensive than some of the competition. While the KitchenAid on our list is a touch on the slow side on its highest speed, the Sunbeam 2525 is extremely fast at its slowest. It’s a bit larger and heavier than the competition, due in large part to its beefy 220-watt motor and the retractable power cord. Unlike most of our other picks, it has traditional beaters with a central post. These are a bit trickier to clean but retain their shape better at high speeds in thick mixtures. The torque and speed offered by this mixer are quite impressive, especially considering the price. This is very much your best choice if you need to mix thick batters with chunky additions at high speeds, or if you’re making meringues. This unit isn’t without downsides. With no legitimate slow speed and lacking a slow start to reduce splatter, things can get messy if you’re not prepared. While we understand why it’s heavy, that knowledge doesn’t make it any easier to lug around. Finally, the beater eject button is in a weird place (it’s a function of the power button). You’re probably not going to accidentally eject the beaters while the mixer is in use but your guests and family members might. 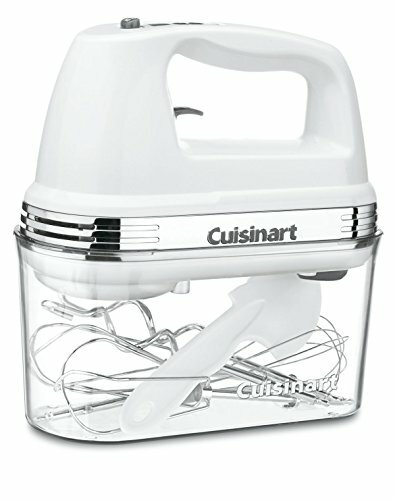 Cuisinart’s 9-speed hand mixer comes with dough hooks, wire whisks, modern post-less beaters, and a case for easy storage. It has a 220-watt motor, giving it the torque to handle tough batters and doughs with ease. There’s a LED display so you know what speed you’re on, and the mixer has a feature to try to reduce splatter by going a bit slower when it starts. The extras offered by this Cuisinart make it a bit nicer to own than the KitchenAid. The storage case works wonderfully, keeping everything together in a compact package that you can slide into a cupboard when you’re done. Because it keeps all the accessories together, you’ll never have to worry about getting your beaters separated in a different drawer. 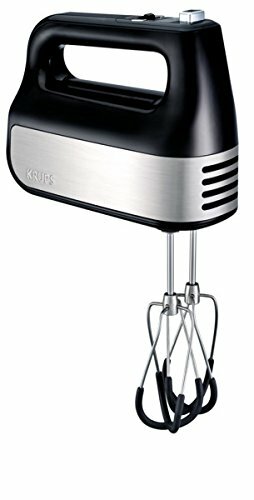 Whisks and dough hooks are included without any additional purchases, meaning that this mixer is a bit more value for money than the sticker price might indicate. Each function of the unit is well designed and thought out. The beater release is a separate lever that locks in place, the cord swivels to make using this mixer easy at any angle, and the unit is surprisingly light for how powerful it is. While there’s a decent amount of differentiation between the slowest and highest speeds, the “slow start” modes aren’t quite as slow as we’d like; you’re still liable to make a bit of a mess if you’re not careful. This sleek and stylish unit from Krups has an impressive 10 speed settings and an added turbo boost for those times when you need more power. It comes inclusive with two silicon-coated beaters; these help make the mixer operate a little more quietly and prevent scratching of your precious cookware. There are also two dough hooks — for bread and cookies — and a whisk for lightly whipping cream. All components tuck neatly inside the included storage case, including the cord. As with the Breville, it features a count-up timer with digital display and a pause option, so you can follow recipes with precision. As opposed to some of our other reviewed models, both the low and high speeds are precise, enabling you to mix super slow or super-fast according to your recipe and ingredients. With the speed settings, there is a noticeable difference between each one. We love that you can lay this unit down on its back when you take a rest, so the dirty, dripping beaters don’t soil your countertop. Although the operation is nice and quiet, there are some design flaws which may become annoying over time. The on/off button and pause button are awkwardly placed, meaning you may repeatedly press them during normal use. The silicone coating not only helps scrape every last residue of your recipe from the sides of your mixing bowls, it also makes for super easy cleaning, even with the stickiest of foods. If you’re looking for a mixer that is super quiet to use, can handle high and low speeds with ease, and is simple to clean, this is a great model that won’t break the bank. Many cooking and baking projects can easily be handled with a hand mixer. Several new mixers feature multiple attachments and high-speed options. The Braun MultiQuick 7 offers users the ability to blend, whip with a whisk, and chop. This tool would be ideal for whipping cream or blending a small batch of soup. For a more traditional shape and tools for making batters and doughs, kitchen tool experts at Cuisinart offer a hand mixer — or immersion blender — with terrific power and plenty of attachments. The Cuisinart 7 speed electric hand mixer features a brushed chrome finish, a spatula for cleaning up, dough hooks, beaters, and a whisk. This unit is built with a storage case that will support your mixer and contain all the tools as well. It’s important to note that hand mixers, while helpful, lightweight and portable, do not offer the power or control found in a stand mixer. 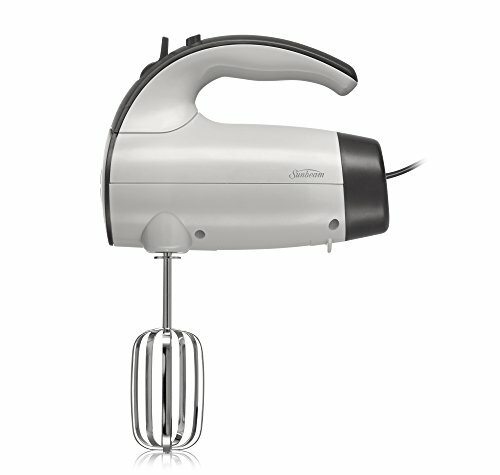 A Kitchen Aid Stand Mixer features a 450-watt motor while most hand mixers sit at around 200-watts. If your baking and mixing needs are minimal, a good hand mixer is a terrific tool and will serve you well. If your goal is to start making all your own bread or start a cookie business, you may be better served to part with the counter space and the money and invest in a heavy duty machine. Even the best hand mixer can only blend so much heavy dough or thick batter before the machine starts to wear down. When deciding between a stand mixer or handheld mixture, be aware that stand mixers provide more power than can be found in the motor of a hand mixer. If you’re mixing bread dough or any thick batter, managing the hand mixer and hanging onto the bowl can be a challenge. Stand mixer bowls are fixed, giving the larger motor a more powerful turning action. Also, there’s a bigger risk of splashing batter around when using a hand mixer, which can be hazardous if batter containing raw eggs gets splashed around your kitchen. Battery powered mixing tools come with a wide variety of attachments and can do loads of kitchen work. While they may take a while to mix a cake, adding one to your stock of bar tools could save you a great deal of time. The kitchen experts at Norpro have created a drink mixer that works on two AA batteries. The Norpro Deluxe Cordless Mini Mixer offers attachments for mixing, blending or whipping eggs or cream. It’s easy to clean as all attachments can go in the dishwasher. Hand-held egg beaters have historically been very awkward to use. This was because the tolerances between the beaters were extremely tight, so the tool would bind as the beaters got stuck against each other. It was hard to tell when the beater was bumping against the bottom of the bowl, so before you knew it you were dealing with problem #1. Luckily, kitchen tool experts at OXO have corrected many of these challenges with their stainless egg beater. This tool has a shaped rubber grip to keep your grip hand away from your crank hand. The blender tools themselves are thin wire, not flat metal, so there’s more space between the beaters. Finally, the beaters can be detached and are dishwasher safe. If you ever struggled to control the jerky, rough movements of your grandmother’s egg beater and just couldn’t get the hang of it, this tool may be just what you need. Mixing tools run the gamut from a simple wooden spoon to a high-powered blender and everything in between. If you’re a beginning baker looking for your first electric mixer, consider a unit that features attachments for dough and a whisk. Thanks Jade! Here is our full review of the Professional 6 series stand mixer!